Tell these programmable thermostats what to do, then get on with your life while they save you money. We offer a wide range of options. Choose the one that serves you best, and stay cool. Or warm. Or cool, then warm...Or call ahead and ask for warm. The average American household spends more than $2,000 a year on energy bills. Nearly half of that goes to heating and cooling. 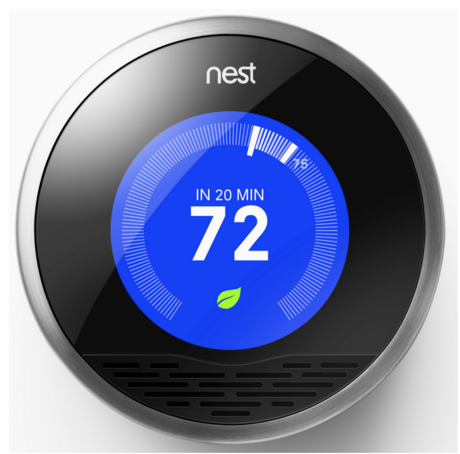 Programmable thermostats are one of the most effective and least expensive tools to combat this cost. Not only do they save money; they reduce energy use and greenhouse gases and add considerable convenience and comfort to your home. Homeowners can save about $220 right off the top by properly setting their programmable thermostats and maintaining the settings. Our recommendation is to buy an ENERGY STAR qualified programmable thermostat because it comes pre-programmed with settings to set the energy-efficient temperatures you’ll be comfortable with--summer, winter and when you’re away. Line volt thermostats connect directly to your electricity and require an electrician’s consultation. Low volt thermostats are more common, and you may be able to install one on your own. To figure out what you need, consider your existing thermostat, your home’s heat source and the number of zones in your home. If you have a baseboard heater, an electric wall heater, forced hot air with a small motor or a restive-rated heater, a line volt thermostat, such as the Aube TH106 240V Thermostat, may be what you need. Line voltage thermostats control electricity directly, and we’d recommend looking up your trusty electrician for a hand. It won’t take more than about 15 minutes, and may go a long way to avoiding unwanted hair spikes. Low voltage thermostats are most common, and are suitable for central heating, ventilation, and air conditioning (HVAC) systems. They can be used with forced hot air and hot water heating systems. Some, like the Aube Programmable 30V Thermostat, have the ability to switch automatically between heating and cooling as needed. Not sure what you’ve got? If your old thermostat is connected to thin wires (that look like speaker wires) coming directly out of the wall, it's a low voltage thermostat, and doesn’t present a shock hazard. Line voltage thermostats have thick, 12 or 14 gauge wires that are probably running off 120 volt current. We strongly recommend that you consult a licensed electrician before attempting to replace a line volt thermostat. Thermostats are available in three schedule types: the 7-day, 5+2-day, or the 5-1-1-day. 7-day models are best if your daily schedule tends to change. 5+2-day models use the same schedule every weekday, and another for weekends. 5-1-1 models are best for keeping one schedule Monday through Friday and another schedule on Saturdays and Sundays. The Aube Programmable 30V Thermostat is an excellent example of a 7-day thermostat. In fact, we're huge fans of the entire Aube line. It's the premium thermostat within the Honeywell family, exceptionally well made and solid. If your electrician, like ours, put the thermostat right under the best spot in your house for a painting, they're also pretty darn good looking. The controls are hidden behind an easily opened door, and they are a worthy object of design--all infinitely controllable. The promised energy savings only apply if the thermostat is properly installed and programmed. Here’s our advice: don’t mess with the settings. Cranking your unit up to 90 degrees or down to 40, for example, will not heat or cool your house any faster, but it will cost you a lot of power. Also consider buying more than one programmable thermostat if your home has multiple heating or cooling zones. Once you’ve installed your programmable thermostat, sit back and relax, knowing that you are saving money and the planet. That makes you cool. Or, maybe it makes you warm. Actually, it just makes you smart. Turn it up, turn it down. The Nest Learning Thermostat remembers what temperatures you like, creates a custom schedule for your home, and turns itself down when you're away. Control it from anywhere with your phone, tablet or laptop. Find out what's working, what's not, and what to do about it. It's free.